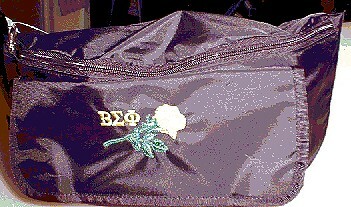 Display all your Beta SIgma Phi Pins on this Unique Badge Holder! Badge is a handmade antique gold Brooch style pin with a 8 1/2 inch Black Velvet Train. Great selection for the entire chapter. Either for those starting out or updating what the group wears. 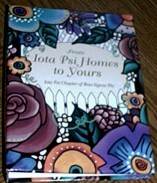 Enjoy or send these brightly colored tattoos to a sister. These can be easily applied with a damp cloth. Great addition to your party favors at socials. They fit really well inside sister greeting cards! The tattoos are 2 X 2 inches. They are $1.00 Each or 7 for $5.00 also add $1.50 for shipping/handling - on all orders! A Collection of Recipes made from ingredients found around the house! Recipes come in a 3 ring binder making it easier to add additional pages. Categories include: Appetizers & Beverages, Soups & Salads, Vegetables & Side Dishes, Main Dishes, Breads & Rolls, Desserts, Cookies & Candy plus This and That. Great gift for a sister that collects recipe books. Enjoy one or more of these bright yellow plastic cups at your next gathering or at the beach! This is a great secret sister gift as well. They can be taken anywhere and easily carried with the easy to hold handle. 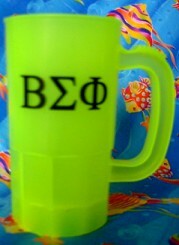 Both sides of the cup proudly display the Beta Sigma Phi greek letters in black. Cups are $3.00 each or 2 cups for $5.00. 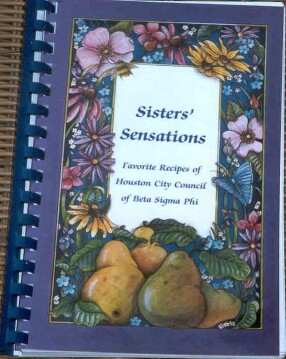 Browse through more than 550 Recipes Houston City Council Members Have Shared in this Exciting New Cookbook called "Sister Sensations"! Experience the recipes and flavor of Texas. YES! Sisters have commented that the guides on the divider pages alone are worth the cost of the book. Featured Sections: appetizers & beverages, soups & salads, vegetables, main dishes, breads & rolls. The Book also includes 7 Divider Pages with helpful guides to assist you with your cooking needs (food quantities for 25, 50 or 100 people, spice & herb guide, equivalent chart, substitution chart, oven chart, roasting guide, contents of cans, microwave hints and more! Enjoy these wonderful Beta Sigma Phi Insignia License Plates for the State of Virginia. Can order up to 6 Letters. Order one even if you don't drive. Cost is $10.00. Makes you a supporter. Play Sigma Bingo with your chapter for a light and entertaining Beta Sigma Phi review. Points on your yardstick! Game consists of 18 different playing cards along with over 40 different questions for you to answer. Photo is of one sample card. I made this game for my chapter one year and we have played it several times. Great for pledge training also. Let Xi Alpha Alpha, Charleston S.C., help you get ready for fall and those walks in the park or for just around the block. 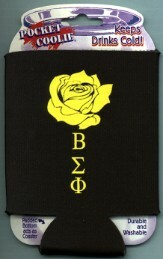 We have designed the perfect sorority pocket koolie. Just $2.50 each and we pay the shipping. Reduced price (06/2005)...What a Deal! 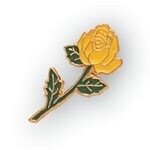 What better way to dress up your badge or your secret sisters badge by adding a special yellow rose pin. Visit Wooble's Place On The Net for ideas and suggestions for working with this year's theme. Copyright © 2001 - 2013 TIKI Services Corporation All Rights Reserved.